Irving Cares. It’s a simple statement. But it’s also a steadfast principle that guides our actions as a corporation and as individual employees – every day. It’s why we’re driven to lead our industry in clean air, clean fuel, and environmental performance efforts using science, technology and good old fashioned common sense. It’s our motivation for endowing universities with hundreds of thousands of dollars in scholarships that reward the achievements of our youth and help solidify their future. It’s the reason why we created Fuel the Care and so many other worthy programs to support our neighborhoods and families in need. It’s why so many of our employees volunteer their time and talent to help the homeless, impoverished families, children with special needs, scholastic and sports groups and important organizations like Habitat for Humanity. Because we have the resolve and the resources to make things better. 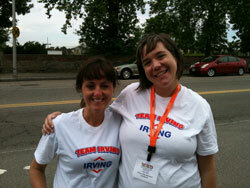 Irving cares.